Set of six Art Deco chairs, solid walnut and Macassar ebony veneer, French polish. New seats with a celadon green velvet upholstery. France, circa 1930. Set of 6 Art Deco dining chairs, French polished beechwood, heathered white fabric upholstery. Design: De Coene, Belgium, circa 1940. Splendid big Art Deco vanity, solid wood base and maple veneer, French polish. Original mirror (oxidation). France, circa 1930. Mirror width: 64 cm. 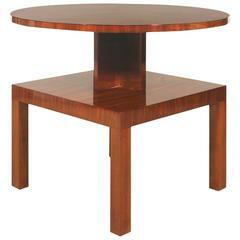 Art Deco cubist side table, walnut veneer with marquetry, French polish, France, circa 1930. Six Art Deco dining chairs of Macassar ebony wood frame with beige fabric. Set of six French Art Deco walnut dining chairs with large decorative wood backboard and dark green coverings, France, circa 1920. Set of 6 French Art Deco Moustache chairs, darkened wood reupholstered in mustard velvet.